Lavalamp.com is your one-stop shop to complete your holiday gift list! Our 2016 Lava® Lamp Gift Guide gives you ideas for members of your family, the kids’ school teachers, friends, coworkers and just about anyone! Everyone loves Lava® lamps! And don’t forget, we will be holding some great sales, so you can save money, get free shipping and even earn a free gift! Check out our website and social media posts for coupon codes for big discounts throughout December. We have a ton of awesome Lava® lamps that kids of all ages will love. New this year, the chalkboard lamps have been a huge hit with kids. These lamps come with chalk, so kids can create cool designs or write notes on the bases and caps. If your children are a bit younger and you’re worried about the heat of a regular Lava® lamp, we have plenty of options that do not get hot. Kids love Fun Lamps like the volcano, fireplace and aquarium lamps. Novelty lights such as Pull Lights and Twinkle lights are made of plastic and run on batteries, making them totally kid friendly and portable. And don’t forget night lights, which are not only perfect to help the kids sleep peacefully, but also to light up your hallways and bathrooms for kids who wander in the night. Teens and college kids show their style by decorating their bedrooms, lockers or dorm rooms. Our heart and star String lights are perfect for lighting up lockers, bedrooms, closets and just about any space. Since they are battery operated, they can even wear them to their fave EDM concerts. Kids also love to party, so they definitely need some Party lights! We have disco balls, strobe lights, beacons and a party mixer that flashes to the beat of the music. If partying is not your kid’s thing, you can’t go wrong with a ColormaxTM, classic Lava® or glitter lamp to chill out with. The brand new Bright Source lamps are already a huge hit! Get a set of 2 lamps for Mom’s bedroom or the family room now. We also have some great Lava® lamps with different shades of pink in a bunch of fun sizes. For the woman who loves bling (and really, who doesn’t want a bit of sparkle in their life) we have a bunch of glitter lamp options as well. And if you know a woman who works hard and needs some relaxation (like pretty much every woman! ), all of our lamps have a calming effect with the slow motion of the lava or glitter and low, glowing light. 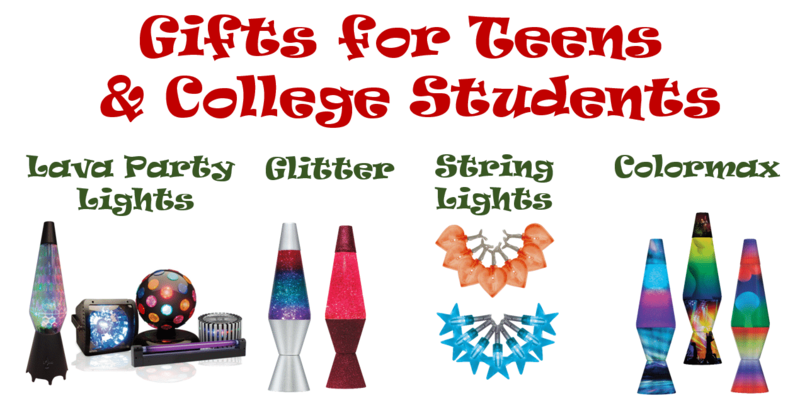 Don’t forget that Lava® lamps make great gifts for your kids’ school teachers. Many teachers use Lava® lamps as a science lesson, so the more lamps in the classroom the better! All of these lamps would make perfect gifts for any of the lucky ladies in your life. Do you have one of those hard-to-buy-for guys on your list? Well, what man wouldn’t want a Lava® lamp? Try the travel stamp decal lamp for the jet-setter who is always flying off to all corners of the world. Or maybe there’s a guy on your list who is a musician or loves to go to music festivals – give him the concert Colormax Lava® lamp. The outdoorsman in your life would love the fireplace lamp, which brings a (faux) fireplace inside during the winter when it’s too cold to be outside camping. If none of that fits the man in your life, get him a Grande! You can’t go wrong with the classic style in the super big size for his man cave. Custom Cool Lamps are the perfect way to give a personalized, special gift for everyone on your list. Create a dazzling glitter lamp with a shiny, metallic gold base and cap for the girly girl in the family or put together a black base and cap with a green and black globe for your nephew, the Hulk lover who already has a thousand superhero action figures. Or maybe your child’s happy, positive teacher who loves rainbows and unicorns would also love a rainbow Lava® lamp to match the rest of her classroom decorations. You can mix and match a globe with the perfect base to complement any type of personality: the wild partier, the yogi, the serious student or the nostalgic grandparent. Customize your gift for all of the people on your holiday list. For more ideas, check out our Gift Guide boards on Pinterest: https://www.pinterest.com/iamlavalamp/. NOTE: Please order your Lava gifts by Monday, December 18 to receive them by Christmas.